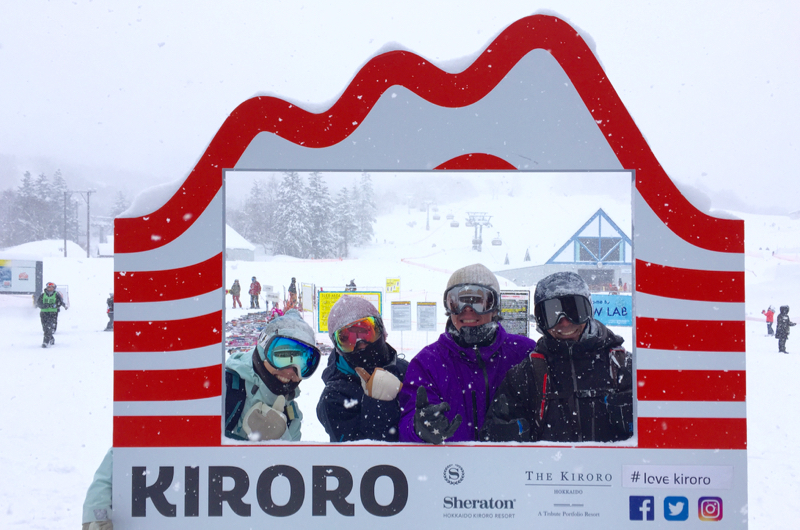 Hokkaido is as famous for its world-class seafood as it is for powder snow, and Hokkaido’s fishermen want visitors to Niseko to know all about it. 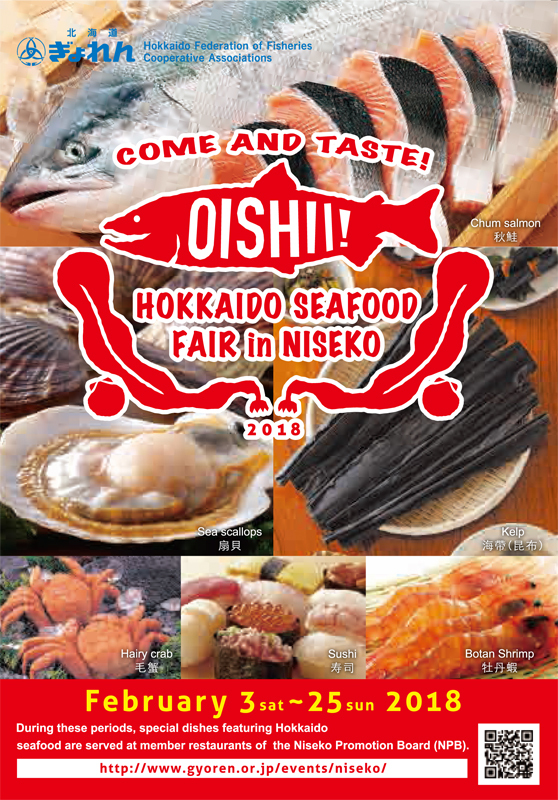 From 3 to 25 February, the Hokkaido Federation of Fisheries is providing selected Niseko area restaurants with some of Hokkaido’s most famous seafood ingredients, and these restaurants will be churning out signature dishes for the duration of the festival. Find salmon, scallops, shrimps and kelp from the pristine oceans of the north in a huge variety of dishes during this time. This year’s special seafood creations range from creamy seafood soup, hot pots, tempura to gnocchi and salads. The lineup of restaurants covers a huge range from Western to Japanese, local izakaya pubs to fine dining establishments, so there is sure to be something for every palate and budget. These new dishes will be on the menu for a strictly limited time, with each restaurant holding limited servings of their chosen ingredient – so be sure to call ahead not to miss out. Crab is the king of seafood in Hokkaido with tourists from home and abroad going all the way to the northernmost island to try the delicacy. From ginormous King crabs with leg spans of over a meter, to delicious hairy crabs, queen crabs and snow crabs, you can find these beasts at morning seafood markets from Sapporo to Hakodate. A good restaurant will have them still kicking in the display cabinet before they’re served! This sweet, gooey orange dish can be a hard sell at first sight, but give it a try – high quality sea urchin should be sweet, creamy and full of umami savory goodness. Hokkaido’s shellfish are huge and fresh and taste fantastic with minimal seasoning. Look out for scallops, oysters, and whelk throughout Hokkaido. Winter is the best season for scallops – great as sashimi or grilled in their shells with butter and soy sauce – perfect! Fished At: West, East and Northern coasts with Soya, Abashiri and Rumoi areas taking the prize for largest and freshest. Seaweed doesn’t strike the western diner as the most exciting ingredient, but this thick brown seaweed is one of the keys to making great Japanese stocks and sauces. Carefully grown, farmed, sun-dried and seasoned, you can see racks of Kelp drying in the sun if you drive by coastal fishing villages in the summer. Quality kelp is an essential secret ingredient to all quality Japanese cuisine, and can only be raised in pristine waters. Hokkaido provides some of the most consistently delicious varieties. 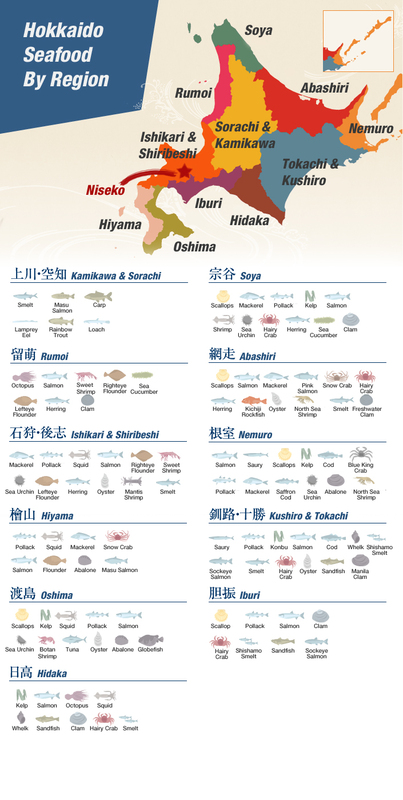 Fished at: All across Hokkaido, with special local varieties on each coast. Salmon Sashimi might be on everybody’s hit list, but it’s far from the only delectable variety of salmon. Hokkaido’s Salmon roe, or Ikura, is lightly salted with soy sauce to bring a tangy flavour. Season: September to October, when salmon make their way back to their homes. Graubunden – Sandwiches, cakes, tea and coffee abound at this local landmark. Niseko Pizza – delicious Italian food and pizza on Hirafu’s main intersection. Robata Niseko Naniwatei – Fine Japanese dining with a set course menu. Watch chefs prepare each dish in an open kitchen.